The mind may be a tool of immense possibility, but in a weakened state it can also become the nucleus for chilling prospects. 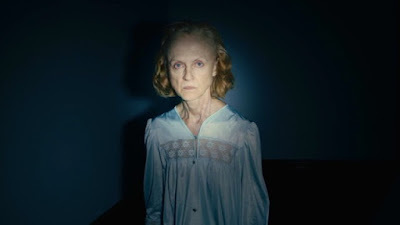 Horror movies have gotten exceptionally convincing at supplying that rationale in order to validate some of their menacing ideas, but they come to an intriguing crossroads in “The Taking of Deborah Logan,” in which the source of terror appears to originate in, of all possible places, a victim of Alzheimer’s disease. She is an elderly and kind lady of proper upbringing who lives out in the great countryside, and when a trio of college students come to document her case for a filmic dissertation on the saddening nature of the illness, their cameras seem to burn a hole through the fabric of their expectations (not to mention the blinders of her caregivers). Sure, a terminal case like this can make any normal person do a number of incoherent things… but is Alzheimer’s itself entirely responsible for violent tendencies? Self mutilation? Or worse yet, moments of delusion in which a house might react with violent warning? 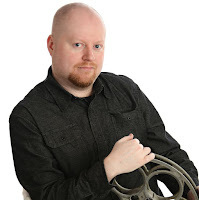 Strange things are gradually overtaking the Logan family, and here are cameras that are unwilling witnesses to a plot that will have everyone involved questioning the validity of what they experience. Like many others in the crowded sub-genre of handheld horror pictures, the movie begins with no thought to exposition; it simply drops us in the lap of the necessary parties as the cameras of amateurs first begin rolling. It is October 2013, and the eager, perceptive Mia (Michelle Ang) has come to meet with Sarah Logan (Anne Ramsay), who is caring for her sickly mother and has volunteered to allow these new visitors to film the progression of her mother’s disease. Young filmmakers often have goals that are as transparent as they are opportunistic, but what would a rather well put-together woman like Sarah be thinking in exposing her dear parent to such invasive observation? It all comes down to the necessity of money; the college will pay for most of Deborah’s treatment, and their house – severely behind in mortgage payments – could stand a chance of being saved from foreclosure. Little of that seems to register with Deborah (Jill Larson), but hey, can you hold anything like that against a woman who is progressing rapidly into the fog of consciousness? The movie arrives at the epicenter of these realizations just as things go from sad to concerning. Mia’s camera footage – intercut with brief documentary interludes explaining the course of the disease – is at first a fairly straightforward account of its subject matter; she begins with interviews with all the core players and then mixes it with more private moments, perhaps to emphasize the strain that the disease puts on all those present. It is clear while watching these exchanges, even without direct reveals, that Sarah and Deborah have their fair share of unpleasant history. And then Mia’s aggressive crewmembers – an anxious cameraman named Luis (Jeremy DeCarlos) and a sarcastic co-director named Gavin (Brett Gentile) – set up an extensive perimeter of surveillance cameras through the Logan house, and things turn bizarre rather quickly. Loud thumping noises are heard in the distance. Windows in the basement seem to open by themselves. Finally, in a moment that plays like the unhinging of proverbial realism, poor disoriented Deborah approaches Gavin with a knife and loudly threatens him, assuming he has stolen her garden spade. And from that moment on, it is no longer a movie about the subject it was intended for – it is a descent into psychological torment. “The Taking of Deborah Logan” is not at all original or distinctive in this volatile genre’s ever-changing standards, but it is cautious, well-made and so driven by believable performances that it earns more respect than one might have assumed it deserves. It also possesses that rare dynamic where the horror seems to occur outside the scope of the premise; here we are not always sure how things are destined to play out, because the dramatic intensity of the early scenes contradicts the suggestion of the later half, and it all evolves from a groove of organic buildup rather than manipulative script gear-switching. By the time the more menacing facets of the plot do reveal themselves, furthermore, there is a genuine stake for us in seeing how the likable main characters progress from it. Sarah is a woman we admire for her morose sincerity, and Deborah occupies a plausible space as a woman dying in rapid increments. Together they carry us through a story that challenges as well as disturbs, mostly in conjunction with situations that are written as if extensions of buried family pain rather than cheap exercises in visual shocks or jolts. None of that is meant to diminish the sting of the movie’s horror elements, however. Consider the details of the screenplay and how the director – Adam Robitel – conveys them on screen. There is almost no soundtrack to speak of, which often orchestrates the pace at which we are expected to react to scary moments. The film offers few explanations (at least in the first act) as to why Deborah acts out so drastically. Is she possessed? Is she suffering some kind of psychotic break? Is a male neighbor, so protective of the elderly victim, always hovering because he knows more than he lets on? The movie keeps us guessing by supplying only necessary details, mostly to emphasize the tension in the uncertainty of explanations. One of the most vital observations is that Deborah is an avid canvas painter, which the movie uses as a framing device to emphasize her malevolent progression, especially as the content of her art descends into dark territory. The biggest asset to that progression, I believe, comes down to a principal of sincere acting. Jill Larson, a well-versed soap opera veteran, does a very good job in convincing us that she is lost in a wilderness of fragmented thought and violence; there are scenes where she simply stares at the camera as if shooting silent threats, and the richness of her conviction creates genuine tension. Anne Ramsay as the concerned but questioning daughter is also noteworthy, if for no other reason than her ability to use wisdom and patience to drive her decision-making, especially in moments – like a very tense climax – that would ordinarily reduce most women in horror plots into mindless screamers. The three young filmmakers, unfortunately, often get lost in this shuffle, mostly because their subjects are simply too overpowering for their own presence to resonate. Who cares that much, really, about a student’s observations when Deborah, the source of chaos, is such an effective channel of terror on her own? In a movie as perceptive as this, the sympathy does not rest on the shoulders of mere observers. The truth runs too deep for them to comprehend, and the fallout is that they must supply a window of observation rather than partake in the chaos for mere survival. Of course the last act will bring all of these elements together in a showdown filled with ominous shadows and supernatural epiphanies, but the movie doesn’t sensationalize them. Sure, the endless supply of scenes in the dark is irritating (doesn’t anyone ever turn a light on in a house to investigate strange noises anymore? ), and sure the big reveals seem shamelessly borrowed from more famous ghost stories of the recent past (“The Ring” was perhaps the primary inspiration). But the values of the picture are more than what their technique has often allowed. The cameras aren’t jerky to the point of incoherence. There’s no rush on part of the screenplay to rack up a body count. And the resolution sequence isn’t an act of tragic finality that cuts off with a bloodcurdling scream; instead, it offers a brief moment of respite before making the startling discovery that true evil must, unfortunately, find a way to endure in others. What all of it amounts to is a recognition of the purity of straightforward motives. The filmmakers of “The Taking of Deborah Logan” never set out to create the most distinctive (or even ambitious) product, but they made one that was in synch to their vision, and they choreographed it with all the style and technical precision of skilled storytellers. Here is a movie more interested in raising the hair on our neck than having us wince in disgust, and it does the job well all while reminding us of the lost art of simplicity.